Okay so I have some really exciting news! 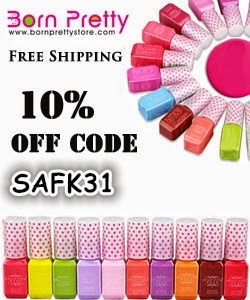 I was recently contacted by Born Pretty Store to review some products from their site! This is really exciting for me because I do my nails and nail art because I really enjoy doing it. To think that a company would approach me to review products for them is pretty awesome in my eyes :)! For those of you that may not know (I highly doubt it) who or what Born Pretty Store is, it's a website that carries everything and anything that you could possibly want for nail art. The prices are low and they also offer free shipping which is a bonus! I've bought a few items from them before and I haven't been disappointed. Here is my coupon code that everyone can use when you're purchasing items. You can also find this code in my right side bar so that you won't have to be looking for this post in the future. I'm just waiting for the products that I'm supposed to be reviewing to arrive. Once they get here that will be done! Have any of you shopped with Born Pretty Store before? What did you purchase?? What great colors for spring!